Hi all! Shcool started for my two boys last week. This week my baby, the youngest will start kindergarten. Wow, all I can say is, "Really?!" I feel like she was born yesterday, now she is so eagar to put her backpack on and go out the door. Will I be sad? Lonely? Maybe so, but I picture myself taking lots of classes, sewing more and who knows, I might be traveling more. While I am going through this journey of mommyhood, taking the time to sew and doing blogging gives me the chance to be ME. And I know so many of you are that way too. It is great to see all of your creations at my link party. Thank you all for sharing a part of you! There are many wonderful talents in this week's link party too, it wasn't easy to pick only a few posts, but here they are. 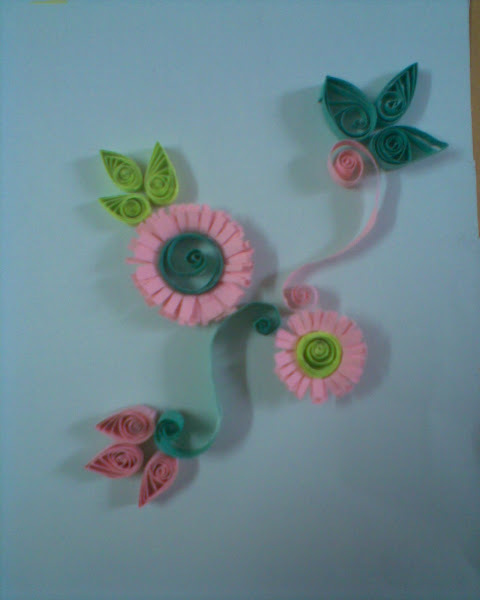 Creative Minde shared her Paper quilling. I always wanted to try this, and she made it look so easy and simple. Beautiful work! Look at this adorable horse! It is made out of a sock, and Kleines Fräulein shares an easy to follow tutorial. 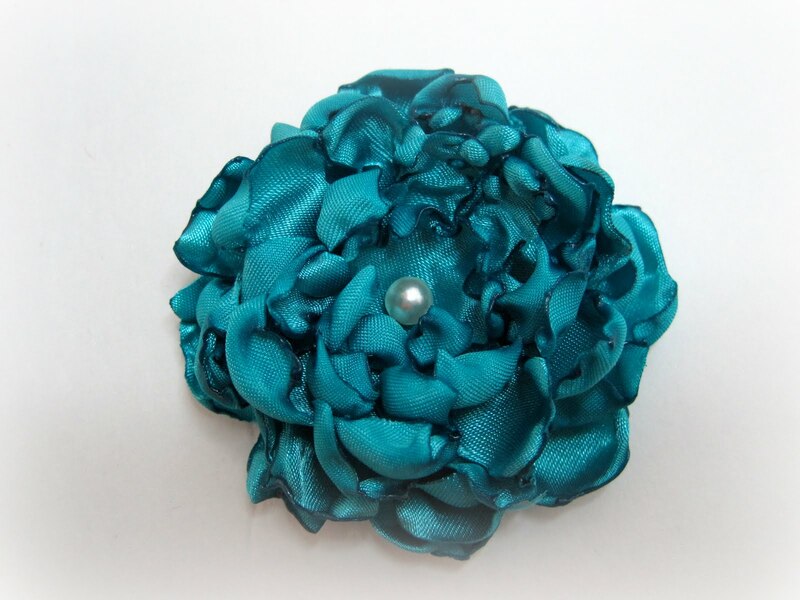 This will make a nice gift for a little boy, or awesome party favor for birthday parties! 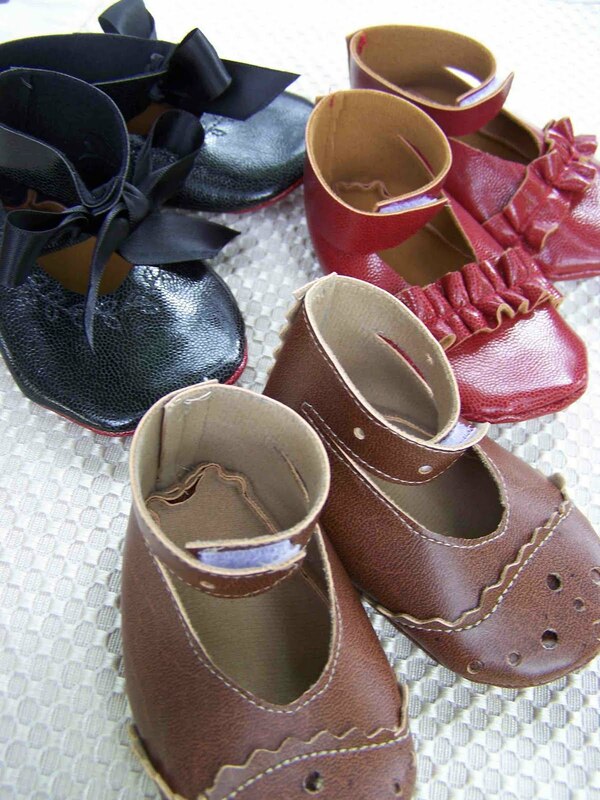 I loove those baby booties! Leafy Treetop Spot made very fashionable and cute booties. My favorite are the brown ones. I have seen so many fabric flowers in the past, but I have never seen a fabric flower this pretty! Our daily chocolate created this beautiful flower and she is thinking about a tutorial in the future... please do so! I wish I had this when my kids were younger, The Planner and the Procrastinator made this portable fabric high chair (with help of This Mama Makes Stuff). I bet this will make so many mothers' lives easier. Thank you all for linking up. I sure appreciate them. I hope you all have a wonderful week! A while ago, I mentioned that I was doing a tutorial for a blanket using the self binding method. I have made so many blankets in the past. I think this is one of the most easiest ways to make baby blankets. It might be a little confusing at first, folding the corner, but once you get used to it, you can finish a blanket in no time! 1. Mark the middle for all sides for both fabrics. Lay them together with right sides together. First, pin the middle of the four sides. Then pin the edges starting in the middle make your way outwards to the corners. 2. Start sewing using 1/4" seam allowance. Remember to leave a 5" opening for you to turn the fabric inside out later. 3. Fold the corner. Draw a line to help you to know where to sew. Use the picture as a guide. 4. Cut the excess off. Repeat the process for the other corners. 5. Press the seam towards the outside with an iron. 6. Turn the fabric inside out. Iron. Pin the opening and top stitch all around the blanket. Wasn't that fun? I have been going through my stash and made some in the past few weeks. They always come in handy for baby showers and such. I hope you enjoyed the tutorial! If you haven't done so, visit my sponsors' page for my 2nd anniversary giveaway. It ends tonight! Before I start the link party for this week, let me share one of the projects I have been working on. I posted about the Liberty of London fabrics and my first project with it. With the second project I have decided to do a quilt. I wanted to preserve them as a quilt, so I can enjoy them longer. and I finish piecing them. I always hand quilt, but I really want to get better at machine quilting. I might do that with this quilt. Rachel kept asking me if this was her quilt. I said no, this is for the whole family to use. Then, she was kept going on how about much she loves this quilt because there are lots of flowers and polka dots. I thought it was so funny, these are the reasons why I love this quilt too! I can't wait for the day that we can start sewing together. So, what have you been working on? Are you ready to share with everyone? I will run the giveaway until the 7th and post the winner on Monday the 9th. Sound good? Hi all, I was on a small vacation, and it took me a while to go through the links. The kids will start school tomorrow... Ah, Summer is officially ending. My family and I enjoyed the last bit of the small vacation, and have prepared ourselves to get back into our school routine. I hope your summer was as fun and as memorable as ours (well, losing the job was sure a memorable moment for us!). Here are the links I spotlighted for this week! Momma Go Round was inspired by one of the Jcrew t-shirts, and she made her version. There are so many ways to do a t-shirt makeover and this is one of the great examples. I LOVE this Menu Board linked by Keepin' the Castle. I have several friend that would love to have this, I might have to give it a try making a few! You gotta check this out! Living with Punks shares a great tutorial on how she made this patch work baby garment. 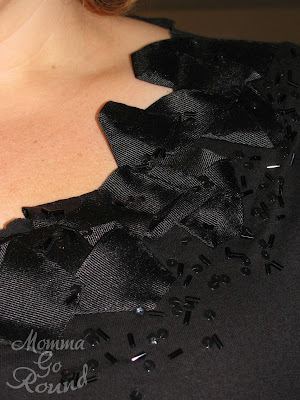 Her fabric combinations are awesome too! One grown up skirt became two little girls' shirts! At Second Street made these adorable tops for her daughters. Looking at projects like this makes you think twice before throwing away your old clothes doesn't it? I have seen a "Bed in a Bag", but I have never heard of this "Office Makeover in a Bag". Erin from A Good Balance made several items to makeover an office for her sister. Such a great idea! Yes, you read it right; I have a special giveaway for my anniversary celebration! Please head over to my sponsors' and giveaway page to read the whole story and learn how you can enter. I talked about running around and being busy lately... so the progress on projects is very slow. Although, I took pictures of some flowers that I saw and they were beautiful! I will share the photos today. I LOVE flowers! Did I tell you I worked at a flower shop once for two weeks? It was a long time ago, and I loved it. Looking at flowers was very calming and relaxing and I really enjoyed it. I also learned that working at a flower shop is not just talking to customers, and making flower arrangements. I had to carry heavy stuff all the time too. After two weeks my leg had it, the pain was way too much that I had to quit the job. I was in bed for three weeks after that. So, I decided that I will just enjoy them whenever I see them. Occasionally, I buy cut flowers to reward myself, but the practical side of me is thinking that "Ah, it's gonna go brown in a week!" So, that doesn't happen that often. OK, let's start the link party, show me what you got! I have been working on something with the Liberty of London fabric, but the progress is very slow and it is not ready to share, yet. Although, I made a new braclet out of the leftovers from the light beige t-shirt project. It is one of my favorite bracelets right now. I think it will be fun to have something like this in fall colors too. My little girl had a birthday party today. It was lots of fun and she had a wonderful time. This is one of the moments where I think about how fast kids grow up. I feel like she was just a baby yesterday, and then bam! All of a sudden she is starting kindergarten. Times like this always remind me that I need to be there for them, and not to miss anything. Of course it is for them but mostly for me... so I don't have any regrets. It is my hope that I can live my life fully with my family and not to waste it. I am totally the list maker, task doer and goal achiever (wannabe). Please don't think I am perfect or anything, I just don't like to sit around doing nothing. That is why, if I am not careful, it is easy for me to get too focused on getting things done rather than, stopping to smell the flowers once in a while. I have noticed that about myself after I started having kids. Don't you think they teach us more than we can teach them sometimes? For some reason this thought came to me... I wanted to share it with you all. Well, it is the time for me to post the link love for this week. I had so many to choose from and it is always very hard to do. I have been wanting to do this for a while and have never got around to it. Looking at these gorgeous stenciled burlap pillows might put end to that. Aren't they pretty? We got a new couch last week and I really want pillows like these. Thank you for the inspiration!! 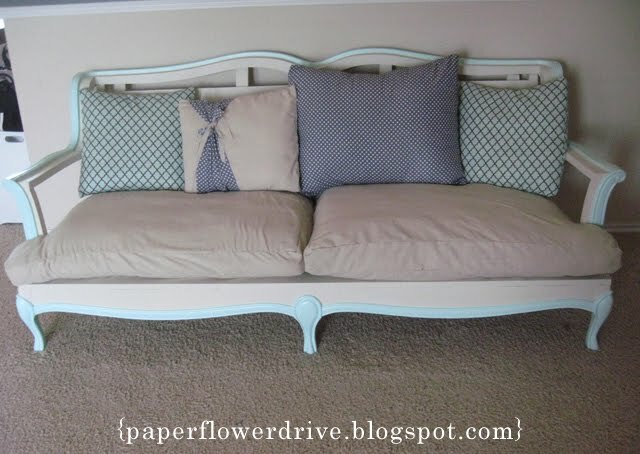 Paper Flower Drive shared how she turned an old couch (you have to go to her blog to check out the before picture) to an amazing bench! Great job!! Now, My Salvaged Treasures is linking for the first time to this link party; I am amazed by her ability to use old yard sale items and create such elegant and beautiful jewelry. Check out this one of a kind watch box! Get Craft'n made this watch box for her husband's watch collection as a anniversary gift. Isn't it such a unique, useful and thoughtful gift? I love it! 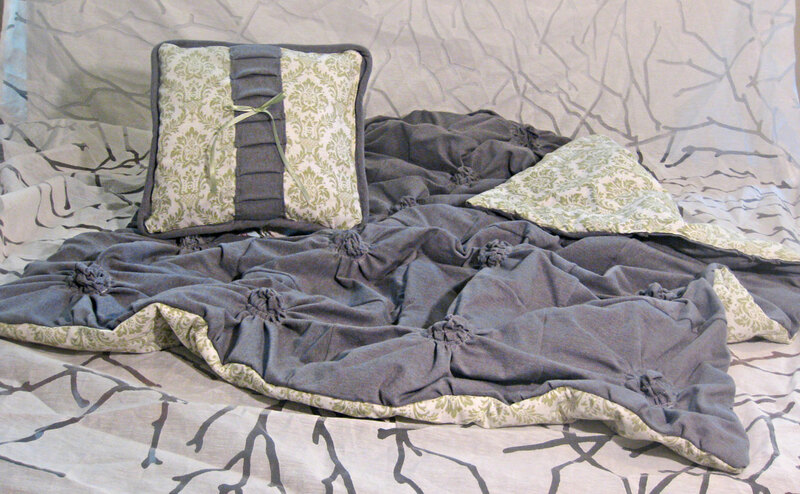 I love this crib bedding set! Sew Over It shared her crib bedding set. 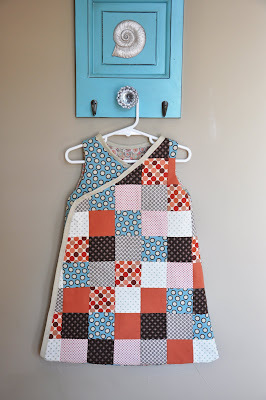 They are not the usual baby color combinations, but I love her fabric choices and how she combined them. Very nicely done. She found this really cute oil cloth online and asked me to make a diaper changing pad and a pouch to put diapers in as baby shower gift. She basically told me that "I trust you, do whatever!" I was excited to work with such cute fabrics. After I found cotton fabric that would go with the oil cloth, I started working right away! First I made the diaper changing pad, then the pouch... after that I made a bib. There are still some small leftover pieces, so I decided to make an organizer for nik naks. I don't have a real "baby" anymore at home, but I love making things for babies, especially for my friends. Thinking about new born babies, the little fingers and little toes, warms my heart. A few posts ago, I wrote about how I bought several items by Liberty of London at Target at a great deal. My motive was to use the fabrics. I have been thinking about what things to make, and finally started working on them last week. The first item that I finished is Rachel's tunic/skirt made from men's boxer. The idea came to me at night and I couldn't wait to start. I started working on it right away. That is why I don't have pictures for a tutorial (I take picture's in natural light). The boxer I bought was XL, and it was $1.25! Isn't that an awesome deal or what? Basically, I just made a skirt out of it, and I also added shoulder straps so she could wear it as a tunic. When I want her to wear it as a skirt I fold the straps in. She really likes it (them?). I have wanted to show you how grateful I am for your readership and comments for a while now, and I wanted to do something to show my appreciation. That is why I decided to do "Four Shirts Four Way" and the giveaway. I thought that eventhough I can't give each one of you a ruffle shirt, I can share my tutorials with all of you so you can make your own shirts! I hope everyone will have a wonderful week!